Five years ago mobile phones were at the forefront of technology, by 2010 the focus was on tablet computers and now billions of yen, dollars and pounds are being invested in what is seen as the next digital playground - the car. Using a hand-held mobile phone while driving a car has been illegal in the UK since 2003. But 10 years later, car manufacturers are hoping that the technology regularly found on smartphones could change the way we use our cars. What this means is app-culture infiltrating the dashboard - from a parking space finder to a way to get coupons for local restaurants, or directions that can pop up on the windscreen. It all relies on the car being connected to the internet, allowing all this information to arrive without too much searching or button pushing and a lot more focus on voice commands. The connected car is already the third fastest growing technological device after phones and tablets, Intel believes. "Ford has categorically stated that this is selling more cars for them," says Jack Bergquist of information company IHS. "Over 50% of consumers would be swayed by the presence of an internet-capable device." The phrase currently being used to describe all this connected material is "infotainment". At present, headlines often focus on the use of social media, integrated internet radio or clever ways to use voice commands. But the internet could be used for much more simple - and practical - things. There are already apps that can show local petrol stations and their prices, allowing drivers to keep going for a few more miles to save a few pence a litre when filling up a car. There is also an app to find a car parking space in some major cities, using electronic sensors, or analysing an aerial view of local street spaces. Perhaps more interesting are the things you never knew you could find out. When stopped at a traffic light, trials have shown a system where a time can pop up on the dashboard letting drivers know how long until it changes. This is not a cheap business. It is thought billions of pounds have been spent so far on the development of these services. By 2020, $600 billion (£380bn) - or 20% of the value of new connected vehicles - will be able to be attributed to "connected life", according to Machina Research. Intel alone is investing $100 million (£64m) in the next five years in companies that can quicken the adoption of connected cars. "By the end of 2014, for some of the bigger brands, every vehicle they sell will offer some sort of connectivity," says Bergquist. "If you look at a cost to design a completely new car model, some companies are spending around a third of the budget just on the in-vehicle infotainment (IVI) and the in-car technology around the system." With driving currently taking every bit of the driver's attention - until at least more progress is made on self-driving cars - critics have warned of safety concerns. Around a quarter of all traffic crashes in the US are caused by mobile phone use in some way, the National Safety Council says. If all this information becomes even easier to access, is there an even greater risk of distraction? "The danger is safety," John Ellis, global technologist for connected services and solutions at Ford, said at a CES 2013 discussion. "You could get caught up in your experience and forget that you're driving. Better, faster cheaper is what consumers want - but with safety." 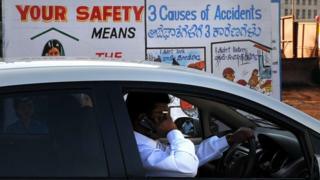 Safety concerns are being addressed with a mandatory sensor which calls emergency services in the event of an accident. Titled eCall, under EU plans all new cars will be fitted with it by 2015. But it is not just on-road safety that is causing developers headaches. "People being able to hack into the car is a big issue," says Bergquist. "If there's a data system in a car, technically someone could hack into it." This hacking has been demonstrated by security consultants who unlocked the doors of a car and started the engine without a key or touching the vehicle itself. It is done by intercepting wireless messages between the car and the network. But the risk, analysts believe, is small because of time spent on security by the companies involved and the risks of failure. "Theoretically, hacking is possible, but car companies are very aware of that risk and busily preparing themselves," says John Leech, of KPMG. "Connected cars will have to be released with appropriately designed security to prevent that hacking." In Ford's new systems, for example, apps are physically separated from vehicle critical devices - making it, it says, impossible to hack between the two. At the moment, a system removed from major mobile operating systems like Android or iOS still exists. Android-based systems have already been demonstrated by a company working in partnership with BMW and most systems in cars can communicate with these devices. But there are predictions that one or two developers are researching ways to turn car technology on its head. "I suspect it will not be car companies but actually someone like Apple or Facebook who will successfully challenge the car manufacturers," says Leech. "It's going to have to be integrated with mobile platforms. "Apple already has a very significant automotive team looking at how best Apple products can be used in-car. If I was betting, that's where I'd put my money." A lot of companies are betting a lot of money on this industry continuing to grow rapidly. If these companies are right, it is only a matter of time before the car could directly compete with the phone and the tablet to be the biggest smart industry. You can safely expect more puns around digital highways, driving data and speeding up innovation to be not too far away.